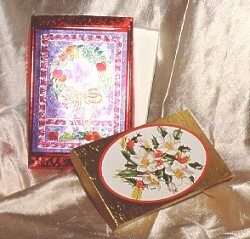 Turn used Christmas cards into beautiful boxes. Cut the card along the fold to separate front from back. Trim about 1/8" off of the back of the card on all sides. Use a ruler and a craft knife for best results. Fold along all the lines. Glue the flaps. Let dry.